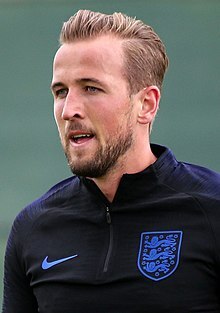 Harry Kane holds the joint-record for the most Player of the Month awards, at six. The Premier League Player of the Month is an association football award that recognises the best adjudged Premier League player each month of the season. The winner is chosen by a combination of an online public vote, which contributes to 10% of the final tally, a panel of experts, and the captain of each Premier League club. It has been called the Carling Premiership Player of the Month (1994–2001), the Barclaycard Premiership Player of the Month (2001–2004) and the Barclays Player of the Month (2004–2016); it is currently known as the EA Sports Player of the Month. The Premier League was formed in 1992, when the members of the First Division resigned from the Football League. These clubs set up a new commercially independent league that negotiated its own broadcast and sponsorship agreements. The Premier League introduced new Manager of the Month and Manager of the Season awards for the 1993–94 season, supplementing the existing Football Writers' Association and Professional Footballers' Association Player of the Year awards. For the 1994–95 season, the Premier League introduced the Player of the Month award, which is presented alongside the Manager of the Month award. The first Player of the Month was awarded to Tottenham Hotspur player Jürgen Klinsmann for his performances in August 1994. Steven Gerrard, Harry Kane and Sergio Agüero have been Player of the Month the most with six awards. Six players have won the award in consecutive months: Robbie Fowler, Dennis Bergkamp, Cristiano Ronaldo, Harry Kane, Jamie Vardy and Mohamed Salah. 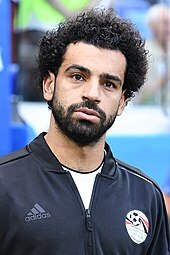 Only Mohamed Salah has won the award three times in a season, and 16 individuals have won two awards in a season: Robbie Fowler, Dennis Bergkamp, Ruud van Nistelrooy, Thierry Henry, Wayne Rooney, Ryan Giggs, Cristiano Ronaldo, Ashley Young, Peter Odemwingie, Robin van Persie, Daniel Sturridge, Luis Suárez, Harry Kane, Jamie Vardy, Sergio Agüero and Son Heung-min. Robbie Keane has won the award while playing for three clubs, while 12 players have won the award playing for two clubs: Alan Shearer, Dion Dublin, David Ginola, Dwight Yorke, Tim Flowers, Teddy Sheringham, Danny Murphy, Andrew Johnson, Nicolas Anelka, Dimitar Berbatov, Scott Parker, Robin van Persie. The award has been shared on six occasions: by Blackburn Rovers's Alan Shearer and Chris Sutton in November 1994, Liverpool's Robbie Fowler and Stan Collymore in January 1996, Southampton's Kevin Davies and Manchester United's Andy Cole in November 1997, Arsenal's Dennis Bergkamp and Edu in February 2004, Tottenham Hotspur's Dimitar Berbatov and Robbie Keane in April 2007 and Liverpool's Steven Gerrard and Luis Suárez in April 2014. Almost half of the Player of the Month awards have gone to English players, and a quarter of foreign winners have been French or Dutch. Manchester United have had more Player of the Month awards than any other club. As of March 2019, the most recent recipient of the award is Liverpool player Sadio Mané. Players marked shared the award with another player. Position key: GK – Goalkeeper; DF – Defender; MF – Midfielder; FW – Forward. Sergio Agüero has won the award six times. Robbie Fowler was the first player to win the award in consecutive months. Steven Gerrard holds the joint-record for the most Player of the Month awards, at six. 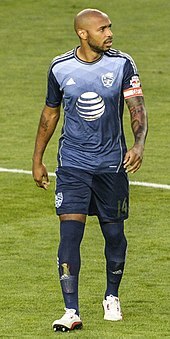 Thierry Henry won the award four times. The first Manchester United player to be given the award was Paul Ince in October 1994. Jürgen Klinsmann won the first Player of the Month award in August 1994. Mohamed Salah became the first player to win three Player of the Month awards in a single season. 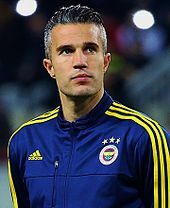 Robin van Persie received five Player of the Month awards. Wayne Rooney received five Player of the Month awards. ^ Each year in the table is linked to the article about the corresponding football season. ^ Gerrard shared his March 2014 award. ^ Bergkamp shared his February 2004 award. ^ Shearer shared his November 1994 award. ^ Keane shared his April 2007 award. ^ Fowler shared his January 1996 award. ^ Suarez shared his March 2014 award. ^ Sutton shared his November 1994 award. ^ Of the English players' 98 awards, 7 have been shared: Alan Shearer and Chris Sutton in November 1994, Stan Collymore and Robbie Fowler in January 1996, Andy Cole and Kevin Phillips in November 1997 and Steven Gerrard in March 2014. ^ The Netherlands' Dennis Bergkamp shared his February 2004 award. ^ Ireland's Robbie Keane shared his April 2007 award. ^ Brazil's Edu shared his February 2004 award. ^ Bulgaria's Dimitar Berbatov shared his April 2007 award. ^ Uruguay's Luis Suárez shared his March 2014 award. ^ Of the forwards' awards, 10 of these have been shared. ^ Of the midfielders' awards, two of these have been shared. ^ Manchester United's Andy Cole shared his November 1997 award. ^ Two awards for Arsenal were shared by Dennis Bergkamp and Edu in February 2004. ^ Two awards for Liverpool were shared by Stan Collymore and Robbie Fowler in January 1996. ^ Two awards for Liverpool were shared by Steven Gerrard and Luis Suárez in April 2014. ^ Two awards for Tottenham Hotspur were shared by Robbie Keane and Dimitar Berbatov in April 2007. ^ Southampton's Kevin Davies shared his November 1997 award. ^ Two awards for Blackburn Rovers were shared by Alan Shearer and Chris Sutton in November 1994. "Premier League Awards". Premier League. Retrieved 13 April 2019. Individual seasons accessed via drop-down list. ^ a b "How the Premier League's monthly awards work". Premier League. 2 September 2016. Retrieved 27 September 2018. ^ a b "Seasonal Awards". Premier League. Archived from the original on 7 July 2007. ^ "Premier League announcement". EA Sports. 8 August 2016. Retrieved 27 September 2018. ^ "History". Premier League. Retrieved 27 September 2018. ^ Nelson, Alex (10 August 2017). "The Premier League's first weekend in 1992 shows how much has changed". i. London. Retrieved 27 September 2018. ^ a b c d e f g h i j "Carling Premiership Player of the Month 1994/95". Premier League. Archived from the original on 11 December 2006. ^ a b "Players". Premier League. Retrieved 13 April 2019. Individual seasons accessed via drop-down list. ^ "Robert Lee wins Carling Player of the Month award". The Independent. London. 9 December 1995. Retrieved 27 September 2018. ^ a b c d e f g "Carling Premiership Player of the Month 1995/96". Premier League. Archived from the original on 10 December 2006. ^ "Charlie Austin named Premier League Player of the Month". Queens Park Rangers F.C. 16 January 2015. Retrieved 27 September 2018. ^ "Dwight Yorke: Overview". Premier League. Retrieved 27 September 2018. ^ "Andrei Kanchelskis: Overview". Premier League. Retrieved 27 September 2018. ^ a b c d e f g h i "Carling Premiership Player of the Month 1996/97". Premier League. Archived from the original on 11 December 2006. ^ a b c d e f g h i j "Carling Premiership Player of the Month 1997/98". Premier League. Archived from the original on 9 December 2006. ^ a b c d e f g h i "Carling Premiership Player of the Month 1998/99". Premier League. Archived from the original on 29 March 2007. ^ a b c d e f g h i "Carling Premiership Player of the Month 1999/2000". Premier League. Archived from the original on 11 December 2006. ^ a b c d e f g h i "Carling Premiership Player of the Month 2000/01". Premier League. Archived from the original on 9 December 2006. ^ a b c d e f g "Barclaycard Premiership Player of the Month 2001/02". Premier League. Archived from the original on 9 December 2006. ^ "Liverpool duo scoop awards". BBC Sport. 3 December 2001. Retrieved 3 October 2009. ^ "Liverpool duo bag award". BBC Sport. 5 April 2002. Retrieved 3 October 2009. ^ a b c d e f g h "Barclaycard Premiership Player of the Month 2002/03". Premier League. Archived from the original on 29 March 2007. ^ "Houllier, Zola bag awards". BBC Sport. 1 November 2002. Retrieved 3 October 2009. ^ a b c d e f g h i j "Barclaycard Premiership Player of the Month 2003/04". Premier League. Archived from the original on 11 December 2006. ^ a b c d e f g h "Barclays Player of the Month 2004/05". Premier League. Archived from the original on 20 June 2007. ^ "Gerrard named player of the month". BBC Sport. 14 January 2005. Retrieved 3 October 2009. ^ a b c d e f g "Barclays Player of the Month 2005/06". Premier League. Archived from the original on 18 July 2007. ^ "Rooney wins monthly player award". BBC Sport. 13 January 2006. Retrieved 3 October 2009. ^ "Redknapp & Liverpool pair hailed". BBC Sport. 10 May 2006. Retrieved 3 October 2009. ^ "Ferguson & Giggs win August prize". BBC Sport. 8 September 2006. Retrieved 3 October 2009. ^ a b c "Barclays Player of the Month 2006/07". Premier League. Archived from the original on 12 July 2007. ^ "Ronaldo wins monthly award again". BBC Sport. 11 January 2007. Retrieved 3 October 2009. ^ "Benitez and Fabregas scoop awards". BBC Sport. 9 February 2007. Retrieved 3 October 2009. ^ "Man Utd pair win February awards". BBC Sport. 16 March 2007. Retrieved 3 October 2009. ^ "Blues claim double award". Metro. London. 13 April 2007. Retrieved 27 September 2018. ^ a b "Keane & Berbatov win April award". BBC Sport. 7 May 2007. Retrieved 3 October 2009. ^ "Man City's Richards claims award". BBC Sport. 14 September 2007. Retrieved 3 October 2009. ^ "Arsenal pair scoop monthly awards". BBC Sport. 19 October 2007. Retrieved 27 September 2018. ^ "Rooney and Hughes handed awards". BBC Sport. 9 November 2007. Retrieved 3 October 2009. ^ "Villa claim monthly award double". BBC Sport. 7 December 2007. Retrieved 27 September 2018. ^ "Wenger and Santa Cruz scoop awards". Premier League. 11 January 2008. Archived from the original on 26 November 2010. ^ "Man Utd pair land monthly award". BBC Sport. 8 February 2008. Retrieved 3 October 2009. ^ "Moyes & Torres win monthly awards". BBC Sport. 7 March 2008. Retrieved 3 October 2009. ^ "United pair celebrate awards double". Premier League. 11 April 2008. Archived from the original on 9 September 2009. ^ "Grant and Young win April awards". BBC Sport. 9 May 2008. Retrieved 3 October 2009. ^ "Southgate and Deco clinch awards". BBC Sport. 12 September 2008. Retrieved 3 October 2009. ^ "Young earns monthly player award". BBC Sport. 10 October 2008. Retrieved 3 October 2009. ^ "Benitez and Lampard scoop awards". BBC Sport. 14 November 2008. Retrieved 3 October 2009. ^ "Megson and Anelka scoop awards". Premier League. 12 December 2008. Archived from the original on 9 February 2009. ^ "Young handed third monthly award". BBC Sport. 16 January 2009. Retrieved 3 October 2009. ^ "Ferguson and Vidic secure awards". BBC Sport. 6 February 2009. Retrieved 3 October 2009. ^ "Moyes and Jagielka scoop awards". BBC Sport. 6 March 2009. Retrieved 3 October 2009. ^ "Liverpool duo claim Barclays awards". Premier League. 3 April 2009. Archived from the original on 6 April 2009. ^ "Ferguson and Arshavin take Barclays honours". Premier League. 8 May 2009. Archived from the original on 11 May 2009. ^ "Spurs duo scoop Barclays awards". Premier League. 11 September 2009. Archived from the original on 14 September 2009. ^ "Torres and Ferguson claim Barclays awards". Premier League. 2 October 2009. Archived from the original on 5 October 2009. ^ "Van Persie claims player of month award". Premier League. 6 November 2009. Archived from the original on 20 April 2010. ^ "Bullard claims monthly honour". Premier League. 4 December 2009. Archived from the original on 7 December 2009. Retrieved 4 December 2009. ^ "Tevez wins Barclays Player of the Month award". Premier League. 8 January 2010. Archived from the original on 27 December 2010. ^ "Rooney named Barclays Player of the Month". Premier League. 5 February 2010. Archived from the original on 6 June 2011. ^ "Barclays awards for Fulham duo". Premier League. 5 March 2010. Archived from the original on 6 June 2011. ^ "Malouda claims Player of the Month award". Premier League. 9 April 2010. Archived from the original on 6 June 2011. ^ "Bale scoops player award". Premier League. 30 April 2010. Archived from the original on 6 June 2011. ^ "Scholes is Barclays Player of the Month". Premier League. 10 September 2010. Archived from the original on 18 November 2011. ^ "Baggies scoop historic Barclays awards double". Premier League. 1 October 2010. Archived from the original on 5 October 2010. ^ "Moyes & Van der Vaart win Premier League awards". BBC Sport. 8 November 2010. Retrieved 27 September 2018. ^ "Bolton duo scoop Barclays awards". Premier League. 3 December 2010. Archived from the original on 6 December 2010. ^ "Mancini and Nasri receive Barclays awards". Premier League. 14 January 2011. Archived from the original on 6 November 2011. ^ "United duo scoop Barclays awards". Premier League. 4 February 2011. Archived from the original on 7 February 2011. ^ "Wenger & Parker win Premier League awards for February". BBC Sport. 4 March 2011. Retrieved 27 September 2018. ^ "Top prizes for Blues pair". Sky Sports. 1 April 2011. Archived from the original on 16 April 2016. ^ "Odemwingie scoops Barclays award". Premier League. 6 May 2011. Archived from the original on 30 August 2011. ^ "Dzeko named Barclays Player of the Month". Premier League. 9 September 2011. Archived from the original on 30 October 2011. ^ "Tottenham Hotspur boss Harry Redknapp picks up award". BBC Sport. 14 October 2011. Retrieved 27 September 2018. ^ "Mancini & Van Persie win monthly awards". Premier League. 16 November 2011. Archived from the original on 7 April 2016. ^ "Redknapp and Parker win awards". Premier League. 6 December 2011. Archived from the original on 12 January 2016. ^ "Ba and O'Neill win Barclays awards". Premier League. 6 January 2012. Archived from the original on 12 January 2016. ^ "Swansea boss Brendan Rodgers & Tottenham's Gareth Bale rewarded". BBC Sport. 4 February 2012. Retrieved 27 September 2018. ^ "Wenger and Odemwingie win Barclays awards". Premier League. 2 March 2012. Archived from the original on 12 January 2016. ^ "Coyle and Sigurdsson win Barclays awards". Premier League. 4 April 2012. Archived from the original on 22 December 2015. ^ "Martinez and Jelavic earn Barclays awards". Premier League. 4 May 2012. Archived from the original on 12 January 2016. ^ "David Moyes named Barclays Manager of the Month". Premier League. 10 October 2012. Archived from the original on 2 February 2016. ^ "Mata named Barclays Player of the Month". Premier League. 6 November 2012. Archived from the original on 2 February 2016. ^ "Fellaini named Barclays Player of the Month". Premier League. 11 December 2012. Archived from the original on 13 December 2012. ^ "Robin van Persie and Andre Villas-Boas win Barclays' December awards". Premier League. 11 January 2013. Archived from the original on 2 February 2016. ^ "Reading pride as Le Fondre and McDermott claim January awards". Premier League. 6 February 2013. Archived from the original on 2 February 2016. ^ "Spurs double up with Barclays monthly awards". Premier League. 1 March 2013. Archived from the original on 29 March 2016. ^ "Vertonghen and Moyes win Barclays awards". Premier League. 5 April 2013. Archived from the original on 2 February 2016. ^ "Benitez and Van Persie win Barclays awards". Premier League. 3 May 2013. Archived from the original on 2 February 2016. ^ "Liverpool double up with Barclays monthly awards". Premier League. 13 September 2013. Archived from the original on 4 August 2015. ^ "Arsenal secure Barclays monthly awards double". Premier League. 8 October 2013. Archived from the original on 11 August 2015. ^ "Aguero and Pochettino claim Barclays awards". Premier League. 8 November 2013. Archived from the original on 7 April 2016. ^ "Newcastle pair claim Barclays monthly awards". Premier League. 8 November 2013. Archived from the original on 19 January 2014. ^ "Suarez and Pellegrini claim Barclays monthly awards". Premier League. 10 January 2014. Archived from the original on 16 July 2015. ^ "Pellegrini and Johnson secure Barclays monthly awards". Premier League. 7 February 2014. Archived from the original on 2 April 2016. ^ "Allardyce and Sturridge receive Barclays monthly awards". Premier League. 14 March 2014. Archived from the original on 5 June 2015. ^ a b "Liverpool claim Barclays monthly awards hat-trick". Premier League. 11 April 2014. Archived from the original on 14 April 2014. ^ "Wickham and Pulis claim Barclays awards for April". Premier League. 2 May 2014. Archived from the original on 5 May 2014. ^ "Diego Costa and Garry Monk win Barclays monthly awards". Premier League. 12 September 2014. Archived from the original on 20 July 2015. ^ "Koeman and Pelle earn Barclays monthly awards". Premier League. 17 October 2014. Archived from the original on 23 July 2015. ^ "West Ham exceed Allardyce's expectations". Premier League. 7 November 2014. Archived from the original on 11 January 2016. ^ "Aguero and Pardew claim Barclays' monthly awards". Premier League. 12 December 2014. Archived from the original on 16 March 2016. ^ "Austin and Pellegrini claim Barclays' monthly awards". Premier League. 16 January 2015. Archived from the original on 22 July 2015. ^ "Kane and Koeman claim Barclays monthly awards". Premier League. 13 February 2015. Archived from the original on 15 October 2015. ^ "Kane and Pulis claim Barclays monthly awards". Premier League. 13 March 2015. Archived from the original on 5 March 2016. ^ "Giroud and Wenger secure Barclays Monthly Awards". Premier League. 3 April 2015. Archived from the original on 12 August 2015. ^ "Benteke and Pearson win Barclays monthly awards". Premier League. 8 May 2015. Archived from the original on 20 March 2016. ^ "Ayew and Pellegrini win Barclays monthly awards". Premier League. 11 September 2015. Archived from the original on 1 February 2016. ^ "Martial and Pochettino win Barclays monthly awards". Premier League. 16 October 2015. Archived from the original on 12 April 2016. ^ "Vardy and Wenger win Barclays monthly awards". Premier League. 10 November 2015. Archived from the original on 3 May 2016. ^ "Vardy and Ranieri win Barclays monthly awards". Premier League. 11 December 2015. Archived from the original on 23 May 2016. ^ "Ighalo and Flores claim Barclays awards for December". Premier League. 15 January 2016. Archived from the original on 25 April 2016. ^ "Aguero and Koeman claim Barclays awards for January". Premier League. 5 February 2016. Archived from the original on 27 May 2016. ^ "Forster and Pochettino claim Barclays awards for February". Premier League. 11 March 2016. Archived from the original on 27 May 2016. ^ "Kane and Ranieri win Barclays awards for March". Premier League. 8 April 2016. Archived from the original on 27 May 2016. ^ "Aguero and Ranieri win Barclays awards for April". Premier League. 11 May 2016. Archived from the original on 5 June 2016. ^ "Raheem Sterling voted EA Sports Player of the Month". Premier League. 9 September 2016. Retrieved 27 September 2018. ^ "Son claims EA Sports Player of the Month prize". Premier League. 14 October 2016. Retrieved 27 September 2018. ^ "Hazard voted EA Sports Player of the Month". Premier League. 18 November 2016. Retrieved 27 September 2018. ^ "Costa named EA Sports Player of the Month". Premier League. 9 December 2016. Retrieved 27 September 2018. ^ "Ibrahimovic named December 2016 EA Sports Player of the Month". Premier League. 13 January 2017. Retrieved 27 September 2018. ^ "Dele Alli wins EA Sports Player of the Month". Premier League. 10 February 2017. Retrieved 27 September 2018. ^ "Kane earns EA Sports Player of the Month award". Premier League. 10 March 2017. Retrieved 27 September 2018. ^ "Lukaku claims EA Sports Player of the Month award". Premier League. 31 March 2017. Retrieved 27 September 2018. ^ "Son wins EA Sports Player of the Month". Premier League. 12 May 2017. Retrieved 27 September 2018. ^ "Mane earns August 2017 EA Sports Player of the Month award". Premier League. 8 September 2017. Retrieved 27 September 2018. ^ "Kane wins September EA Sports Player of the Month award". Premier League. 13 October 2017. Retrieved 27 September 2018. ^ "Sane wins October EA Sports Player of the Month award". Premier League. 17 November 2017. Retrieved 27 September 2018. ^ "Salah named November 2017's EA Sports Player of the Month". Premier League. 15 December 2017. Retrieved 27 September 2018. ^ "Kane matches Gerrard with December 2017 EA Sports player award". Premier League. 12 January 2018. Retrieved 27 September 2018. ^ "Aguero named January 2018 EA Sports Player of the Month". Premier League. 16 February 2018. Retrieved 27 September 2018. ^ "Salah named EA Sports Player of the Month for February". Premier League. 9 March 2018. Retrieved 9 March 2018. ^ "Salah makes history with EA Sports award". Premier League. 13 April 2018. Retrieved 13 April 2018. ^ "Zaha claims first EA Sports Player of the Month award". Premier League. 9 May 2018. Retrieved 9 May 2018. ^ "Lucas: I am so happy to win this award". Premier League. 7 September 2018. Retrieved 27 September 2018. ^ "Hazard named EA Sports Player of the Month". Premier League. 12 October 2018. Retrieved 12 October 2018. ^ "Aubameyang eyes top four after winning player award". Premier League. 9 November 2018. Retrieved 9 November 2018. ^ "Sterling named EA Sports Player of the Month". Premier League. 12 December 2018. Retrieved 12 December 2018. ^ "Klopp and Van Dijk claim December awards". Premier League. 11 January 2019. Retrieved 11 January 2019. ^ "Rashford named EA Sports Player of the Month". Premier League. 8 February 2019. Retrieved 8 February 2019. ^ "Aguero voted EA Sports Player of the Month". Premier League. 8 March 2019. Retrieved 8 March 2019. ^ "Mane wins EA Sports Player of the Month". Premier League. 12 April 2019. Retrieved 13 April 2019. This page was last edited on 16 April 2019, at 15:53 (UTC).